We make skin and hair care products that are handcrafted, organic and chemical-free. 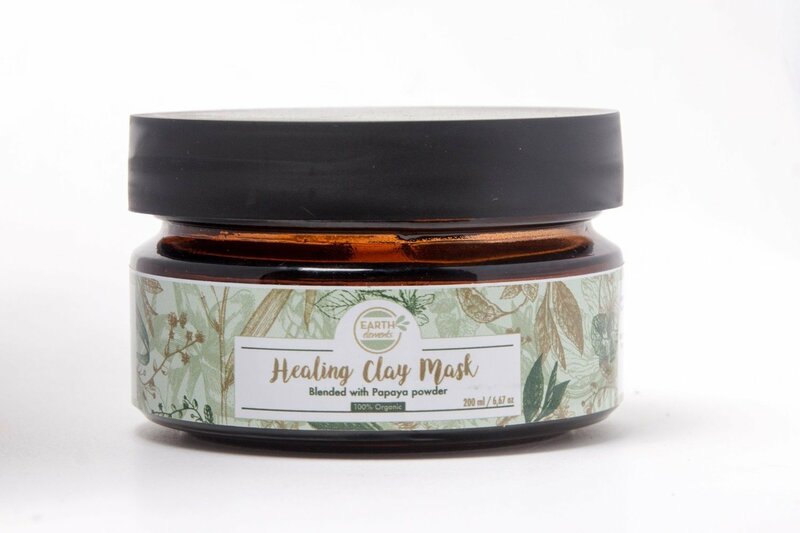 Our Healing Clay Mask has wonderful beauty benefits. It does not strip the skin of natural oils; due to its mild nature it is perfect on all skin types and since it dries up, and contracts it increases blood circulation. Ideal for cleansing the pores and prevents pores from clogging up. With a non-metal spoon and in a small non-metal bowl, mix 2 to 3 teaspoons of the clay with an equal amount of either water, yoghurt or apple cider vinegar. Apply the paste to clean/exfoliated skin - avoiding the eye and lip area. Leave on for 15-20 minutes and rinse with warm water. Use once or twice per week. Repairs scarred skin. Lightens age spots and pigmentation. Minimizes wrinkles. For best results, use with along Earth Elements Healing Balm. Earth Elements ™ is a family business established in 2016 by sisters, Deidrè Akaloo and Lynnette Murua. Our journey is to create environmentally friendly products – our work began and was nurtured over a period of three years. During this time we were, and still are involved in production and product development. We personally source and blend every product using the finest ingredients derived from the earth to nourish and moisturise the skin. Our products are handcrafted, organic and chemical-free.We have invested and researched the quality of our ingredients; we strive to deliver products that inspire confidence and hold credibility. We have collaborated and subscribed to various bodies that offer the certifications and confidence that we produce only the finest quality products, with the purest ingredients.We are members of the Global Shea Alliance – the alliance ensures that our Butters are sourced from ethical Woman’s Co-operatives. Our affiliation with the Cosmetics Toiletries and Fragrance Association of South Africa ensures that we are committed to maintaining the high quality and safety for cosmetic products. Yes, the delivery date of your order can be changed up until three (3) days before the scheduled date. To make this change, contact our Customer Care team. Most orders are delivered between 2-3 working days. You can track your order online or contact us if your delivery hasn’t arrived on time. We currently deliver to all areas in South Africa and we also deliver International. All online payments are processed via PayFast and we gladly accept Visa, Mastercard, Bitcoin, InstantEFT. We also accept SnapScan, Visa, MasterCard and EFT payments. Your card is charged immediately when you submit your order. What happens if there is a pricing errror? We do our best to provide accuracy in the pricing and other product information displayed on our website, but mistakes sometimes happen. In such cases, we expressly reserves the right not to honor pricing errors found on this website when accepting an online order. If an error occurs, we’ll let you know and cancel the order. Any authorized payments for that order will be immediately refunded. If you find an error once your order is delivered, please contact our Customer Care team or refer to our refund policy. Are your products limited to particular ethnic group? No, Earth Elements™ skin and hair products are natural, simple and easy to use and can be used by all ages and all ethnic groups. Some of the hair products may be applied differently depending on your hair type, but the products can be used by all ethnic groups. I'm a vegan, can I use your products? Yes, none of products are tested on animals or made from animal by-products. We are endorsed by Beauty Without Cruelty and the Vegan Society of South Africa. I'm allergic to nuts, can I use your products? Most of our products are extracted from nuts and are manufactured in a factory with other nut based products – people with severe nut allergies are advised against using the products unless advised otherwise by your physician. I am taking heavy medication and it's affecting my hair, can your products help restore hair health? We have had positive feedback from clients currently on medication for Lupus and chemotherapy; however your hair health is affected by medication and the best results are achieved when patients are no longer taking the heavy medication. Our products are 100% natural and chemical free and can be taken while you are taking medication and recovering. Can your products be used on children and babies? Yes, we have a hair oil for children that have mild essential oils and a baby moisture balm made with pure, unrefined Shea butter and coconut oil. Will the hair oil repel head lice? Yes, peppermint and lavender are oils that repel head lice. Daily use of the kids treatment oil with lavender, will repel head lice. The Daily Treatment oil has peppermint – the peppermint oil, the smell is a little stronger and is more effective as a repellent, the daily treatment oil can be used on kids, 6 years and upward. I have eczema on my scalp, what can I use? The daily treatment oil immediately soothes and calms eczema, the oil relieves the itching and the flakiness. The oils can be used every day or 3 to 4 times a week, just before washing. I have eczema on my face and body, what can I use? There are a variety of combinations that can help – the pure Jamaican Black castor oil massaged into the skin before bath time or facial cleansing. The Healing Balm can be used in the mornings – after cleansing, followed by your normal beauty routine and/or just before bedtime. The Shea Butter and Roman chamomile combination calms and soothes eczema naturally. I have pimples and severe acne, can I use your products? Yes, the Clearing Balm clears up acne and helps to prevent scaring without burning or drying out the skin – use after cleansing and toning. I get razor bumps from shaving, do you have a product that can help? Yes, you can use our shaving balm before shaving for a smoother shave or as a moisturiser after shaving. Use warm water to rinse the blade. Our products are all natural and wild grown, chemicals or growth hormones are not used to grow or process any of our raw materials. Why we use glass containers? Glass preserves the freshness of its contents, plus it is a healthier choice, because it’s free of BPA and other synthetic chemicals. Additionally, it has a longer shelf life than most other forms of packaging, is less damaging to the environment during the manufacturing process, is 100% recyclable, and let’s just be honest… it simply looks better.